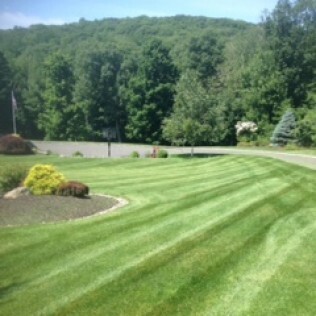 Call Grass Roots Inc., a leader in landscaping and grounds maintenance in western CT. In Connecticut, the seasons make many demands on our time in yard cleanups and grounds maintenance. Could your property benefit from professional landscaping? We have suffered through some severe weather lately, and tree and leaf debris is a chore to clean up. Post-storm cleanups are no problem for Grass Roots Inc. When your lawn needs some extra care, call Grass Roots Inc. Grass Roots provides a variety of routine lawn services, such as seasonal yard cleanups, lawn thatching, mulching, mowing and more. Grass Roots Inc is a full-service Connecticut landscaping company serving the greater Danbury CT area. Among the services we offer are landscape design, property maintenance, lawn care, pest control and more. Bring color, interest and appeal to your front yard, or enhance your patio area with natural stone or pavers. Our professional design team will add beauty to your yard with unique features and treatments that enhance your property and set it apart from your neighbors. By definition, to landscape your property is to make it more attractive and more suitable for your family. The addition of trees, live plants for ground cover, hardscapes, water features, outdoor entertaining areas, walkways and colorful border gardens will improve the appeal of your property. Whether your landscape requires a major overhaul or could benefit from seasonal grounds maintenance, speak to the friendly staff at Grass Roots. We will show you the best way to plan a landscape treatment that suits your needs and will fit your budget. Our customers spend more time relaxing and entertaining out of doors after an installation. We believe our commitment to customer relationships sets us apart from the rest. You can be assured that Grass Roots will only use quality products on your project. When you are ready to get moving on your property’s landscape needs, give Grass Roots Inc. a call at 203-746-6638.